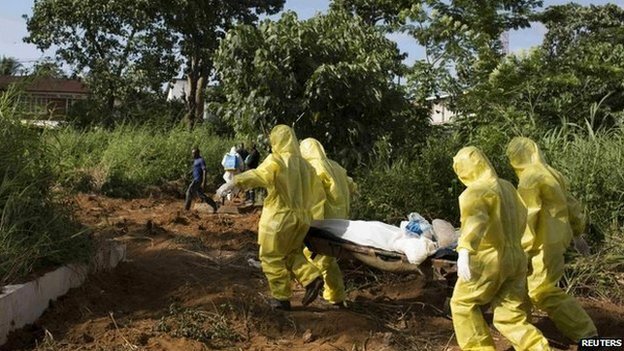 Health officials in Sierra Leone have discovered scores of bodies in a remote diamond-mining area, raising fears that the scale of the Ebola outbreak may have been underreported. The World Health Organization said they uncovered a “grim scene” in the eastern district of Kono. A WHO response team had been sent to Kono to investigate a sharp rise in Ebola cases. Ebola has killed 6,346 people in West Africa, with more than 17,800 infected. Sierra Leone has the highest number of Ebola cases in West Africa, with 7,897 cases since the beginning of the outbreak. The WHO said in a statement on Wednesday that over 11 days in Kono, “two teams buried 87 bodies, including a nurse, an ambulance driver, and a janitor drafted into removing bodies as they piled up”. Bodies of Ebola victims are highly infectious and safe burials are crucial in preventing the transmission of the disease. The response team also found 25 people who had died in the past five days piled up in a cordoned section of the local hospital. Health officials are worried that many of the Ebola cases in Kono have gone unreported until now. “We are only seeing the ears of the hippo,” said Dr Amara Jambai, Sierra Leone’s Director of Disease Prevention and Control. The district of more than 350,000 inhabitants had reported 119 cases up to 9 December. Authorities in Sierra Leone have decided to put Kono district on “lockdown” from 10 to 23 December to try and contain the outbreak. During the lockdown, no-one will be able to enter or leave the district but they can move around freely within it. Posted on 12th December 2014 by newsafrica. This entry was posted in Africa, Ebola, Health, Sierra Leone. Bookmark the permalink.